I have studied the subject of Organizational Behavior for over 20 years. My last article “What is a Learning Community Anyway?” was the first of a series of articles on organizational structure. In these studies, I will clarify and define some of the differences in Learning Communities (like TheMALC) and more classical organizational structures. Dr. Joshua Williams’ research paper, Personality Styles Which Influence Organizational Safety has helped me understand how important individual personality types and attitudes are in defining any organization. Complainers --- usually voice concerns to express displeasure; not to make improvements. They regularly find fault with the organization and their fellow members. Sideline Spectators --- seldom voice their concerns, as they perceive their actions will have little or no consequence on the organization as a whole. They seldom get involved in change making or other initiatives. Champions --- express their concerns constructively and work effectively with others to make improvements. They have a positive outlook toward other members and the organization as a whole. Primary Feelings: confidence, happiness, contentment, optimism. Using the above models, we find that numerous Champions at all levels of an organization creates a healthy culture. Sideline Spectators and, especially, Complainers continue to create a negative and unhealthy culture, not only for themselves, but for the entire group. In common usage, ATTITUDE refers to a person’s internal state. It is a schema or internal pattern of thinking. We are unable to directly perceive what a person is thinking. We can only infer his cognitive position (attitude) from his external behaviors, such as posture, tone of voice, etc. Poor individual attitudes often manifest in organizations where optimal communication strategies aren’t used. 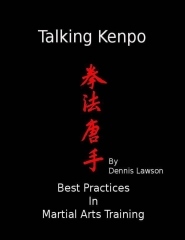 Classically structured Martial Arts organizations often have poor methods of resolving conflicts between members, or members and administration. This one area (disputes) has been the impetus for the creation of numerous “splinter” organizations. Often, these “new and improved” groups have the same old beliefs (internal pattern of thinking), attitudes, and similar methods of conflict resolution. This is one example of how an “organizational schema” becomes internalized. Negative attitudes can last for years and can easily be spread to others. For a culture to remain healthy; all associates must be able to voice a concern, support an initiative, and especially, feel that they are heard. For any community to thrive it must foster the development of Champions, now and in the future. What makes a healthy culture? Own up to past mistakes and create positive change in the present. This helps develop a better future for all concerned. Treat all mistakes as learning opportunities not as occasions to blame or punish.